Download: .MID File data (in .zip file with .pdf manual). PC/Mac (disk): CD + printed manual (with free access to downloadable .zip file). Audio CD: Audio CD + printed manual (with free access to downloadable .zip file of the .mid version). $80 total. AKAI format CD-ROM: AKAI S-1000 format CD-ROM + printed manual (with free access to downloadable .zip file of the .mid version). $249 total. BASIC 4/4, BOG STANDARD, LAYING BACK IN 4, DOTTED SIDESTICK, HALF TIME, HALF TIME COWBELL, EXPRESSO, FAST LINEAR, 2 HAND RIDE, 2 HAND RIDE FUNK, 13/8 FUNK, 11/8 FUNK WITH COWBELL, LAYING BACK IN 5, SWAGGERING IN 6, MORE SWAGGERING IN 7, URGENT IN 12, LATIN FUNK, SANGRIA, SOFT SPIDERY SONGO, COWBELL FUNK, SWING, PING PONG, SWING SONG, BRUSHED VELVET, BRUSH ROLLS, LOG DRUM, HAND DRUM, MINI CUPS, TAMBOURINE, BLOCKS AND BELLS, MODULATED HATS, PROTO PUNK, IND FUNK, MANACLES, DOTTED 4, KLANGFARBEN, WOBBLE BLOCKS, BOOBAM ROLLS, PEACOCK GONGS, SHAKERS, STARBELLS. A very special collection of loops from Bill Bruford (Yes, King Crimson, Earthworks, and beyond), one of the world�s most original and sought-after drummers. Divided into 'Acoustic' and 'Electronic' beats, the collection was recorded personally by Bill Bruford with meticulous care to preserve the feel and idiosyncrasies of this material. The MIDI version can of course be voiced at will, and has also been converted into native Motif / Motif ES Pattern formats. 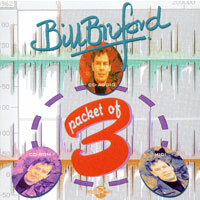 The audio versions (CD-Audio and CD-ROM) offer Bill Bruford's own acoustic kit and Simmons SDX kit sounds for which he is so rightly famous.